书籍简介: Beginning with the Reagan administration,the U.S.government has steadily instituted policies and legislation that favor corporations over citizens,argues Air America host Hartmann(The Ultimate Sacrifice).Analyzing the rhetoric and policies of the current administration's \\\\\\\\\\\\\\\\\\\\\\\\\\\\\\\\\\\\\\\\\\\\\\\\\\\\\\\\\\\\\\\\\\\\\\\\\\\\\\\\\\\\\\\\"compassionate conservatism,\\\\\\\\\\\\\\\\\\\\\\\\\\\\\\\\\\\\\\\\\\\\\\\\\\\\\\\\\\\\\\\\\\\\\\\\\\\\\\\\\\\\\\\\" Hartmann goes on to detail the ways in which safety nets for working people(from progressive taxation to antitrust legislation to Social Security)have been steadily weakened,and argues that an empowered,educated middle class is crucial to a functioning democracy.Chapters detail the ways in which what gets called \\\\\\\\\\\\\\\\\\\\\\\\\\\\\\\\\\\\\\\\\\\\\\\\\\\\\\\\\\\\\\\\\\\\\\\\\\\\\\\\\\\\\\\\"the free market\\\\\\\\\\\\\\\\\\\\\\\\\\\\\\\\\\\\\\\\\\\\\\\\\\\\\\\\\\\\\\\\\\\\\\\\\\\\\\\\\\\\\\\\" is not really free(for good reason,he notes),how \\\\\\\\\\\\\\\\\\\\\\\\\\\\\\\\\\\\\\\\\\\\\\\\\\\\\\\\\\\\\\\\\\\\\\\\\\\\\\\\\\\\\\\\"We the People create the middle class,\\\\\\\\\\\\\\\\\\\\\\\\\\\\\\\\\\\\\\\\\\\\\\\\\\\\\\\\\\\\\\\\\\\\\\\\\\\\\\\\\\\\\\\\" how the policies of the Founding Fathers and figures like FDR still have a lot to teach us,and ways for \\\\\\\\\\\\\\\\\\\\\\\\\\\\\\\\\\\\\\\\\\\\\\\\\\\\\\\\\\\\\\\\\\\\\\\\\\\\\\\\\\\\\\\\"Leveling the Playing Field.\\\\\\\\\\\\\\\\\\\\\\\\\\\\\\\\\\\\\\\\\\\\\\\\\\\\\\\\\\\\\\\\\\\\\\\\\\\\\\\\\\\\\\\\" Though far from comprehensive,and despite its sensationalist title,Hartmann's latest is an intelligent critique of the contemporary plight of the middle class. 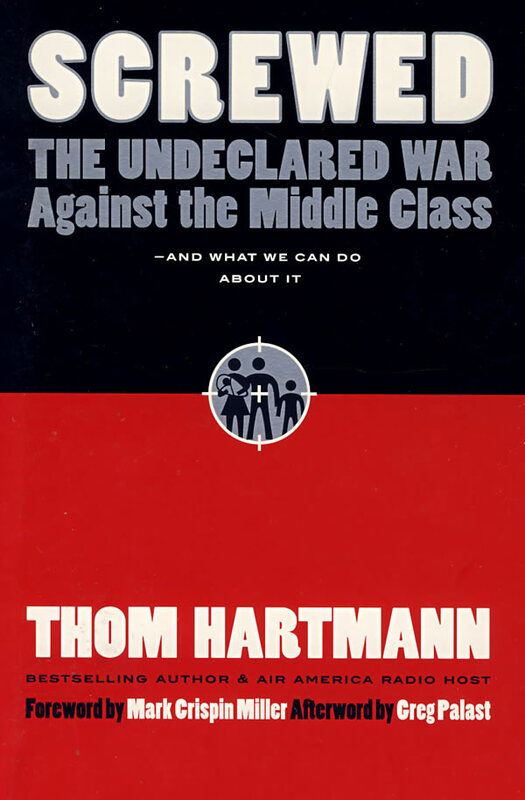 Nationally syndicated radio host and bestselling author Thom Hartmann exposes the covert war conservatives,and corporations are waging against America's middle class?a war that's reducing the rest of us to a politically impotent working poor.This book asks: How did this happen? Who's benefiting? And how can we stop it?